Statement gemstone necklace from the "Noir" collection by Paula Rosellini. 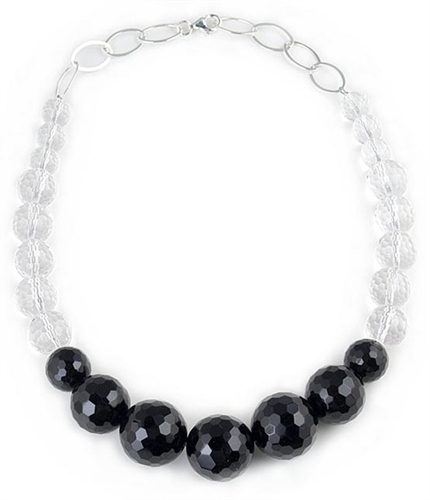 This stunning necklace features graduated faceted rock crystals and seven faceted black onyx semi-precious stones, finished with a large link sterling silver chain. Rock crystals measure 10mm and 12mm and onyx stones 14mm, 18mm and 20mm. Necklace measures 46cm (18.1") in total length and fastens with a sterling silver lobster clasp. A statement piece of designer jewellery and a classic piece that will add instant glamour to any outfit. Also makes a wonderful gift idea. Available exclusively in the UK from Farfallina.net Jewellery Boutique.